Tell me a little bit about how you got into the Youtube world and what are some of your inspirations? Imani: As a young girl, I never really had a lot of confidence. When you don’t have that, you feel empty. Makeup filled that void for me. Makeup isn’t a permanent solution to low self-esteem but it really helped me. Now, I use makeup as a way to appreciate my features instead of covering them up. My whole life, I knew I loved science but I knew that I didn’t want to be a doctor. When I found out about cosmetic chemistry, I knew I had to follow that path. I want to be able to cultivate and create makeup to actually make a difference with makeup instead of just putting it on my face! You talked a little bit about going from covering up your features to embracing them. How would you describe your style now? Imani: I am a girl who likes “beauty on a budget.” So, I got this at my local beauty supply store for literally $1. It’s by Broadway Cosmetics and it’s their Coconut Oil Lipgloss. It’s my favorite! Your Youtube page is so versatile and while only being on the platform for 5 months, some of your videos are already hitting several thousand views! How do you stay inspired to diversify what you show to your audience? Imani: Anything that I can do that can help someone, I’m going to do. Questions I receive from my friends like: “How do I do my edges?”, “How do I do nails on a budget?”, or “How do you take care of your skin?” I try to make videos to help others who may have the same questions. I’m not comfortable putting anything out that I don’t feel 100% confident about. So, if I need to take a break to better myself and my content, I’ll do that so I can be proud of my work. It’s 2018 and we are just now starting to see major brands take notice of the need for more representation in their products. As a Black woman working in the industry, how do you stay inspired and motivated when brands continually to fail to broaden their consumer base and/or generate products that are not WOC friendly? Imani: Something that is so empowering about being a Black woman in the community, is the fact that we have to get more creative with our looks because we are so used to brands not being tailored to us. A lot of the time, when brands try to “diversify” their products, shades they produce aren’t reflective of our skin tones so we still have to be creative. We’re adaptable and so our makeup reflects that creativity. What your favorite Black friendly products that you use on the regular? 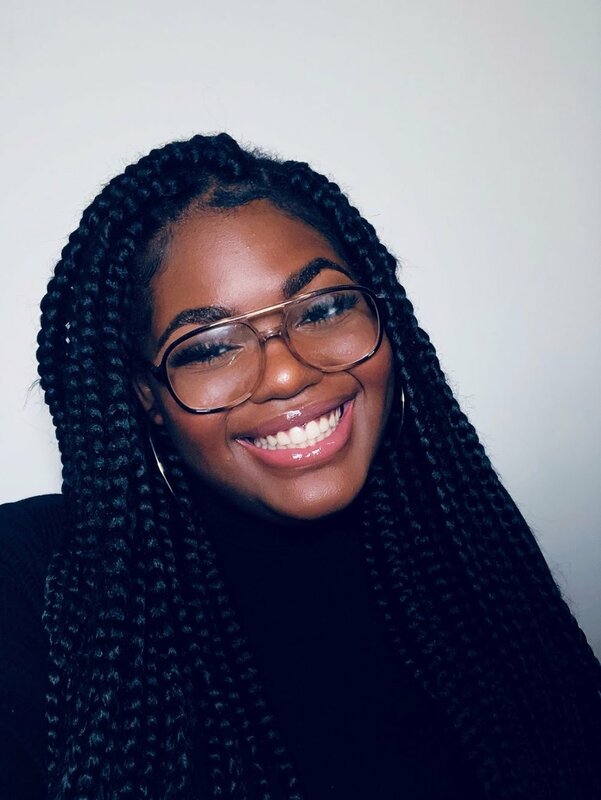 Imani: My brands are definitely centered around drugstore and cost-effective makeup. I’ve always gravitated towards Nyx, RubyKisses, and Black Radiance. For eye-shadows, especially with all the different skin tones Black women have, I’ve found we need to splurge on higher-end products sometimes to get that color pay off for our looks. On the lower end, Morphe has some great palettes that I love. The Crayon Case is another brand that I also love that isn’t too expensive. What are three of your “go-to” beauty products that you recommend to our readers? Imani: A good eyebrow pencil is a must. Nyx’s Micro Eyebrow Pencil is amazing! The Coconut Lipgloss by Broadway, that I mentioned before, and finally, Ardell brand of Wispy Lashes are must have items that are pretty cheap. Imani: Hopefully as a college graduate, working in a makeup lab as a cosmetic chemist. In regards to my Youtube, I want to make it bigger and better. I am currently filming on my phone. I spent $15 on a tripod and $20 on a ring light on Amazon, so I want to get better equipment. A lot of creators on Youtube have really nice equipment. My goal is to make my channel greater and grander for my subscribers. I want to see my channel grow and be able to look back seeing the growth in both the overall quality as well as the content of my videos. What do you have to say to the working/busy Black woman who has limited makeup knowledge, but still wants to feel “made up” and doesn’t know where to start? Imani: I would say, a little definitely goes a long way. You don’t need to have a “beat” face every day to be beautiful. A little concealer under the eyes, some mascara, and some lip gloss or tinted lip balms/lipstick can brighten your face without being too much for the everyday. Lastly, what do you want your viewers to take away from your channel and social media? What kind of legacy do you want to leave in the community? Imani: I would say that, even though you may see the way I do my makeup and my style on my channel, makeup is so unique to the individual applying it. There is no wrong or right way to do it, so just run with it. Just do you and know that it’s okay to be your own version of beautiful. Make sure you check out her social media links below and give her a like and subscribe!